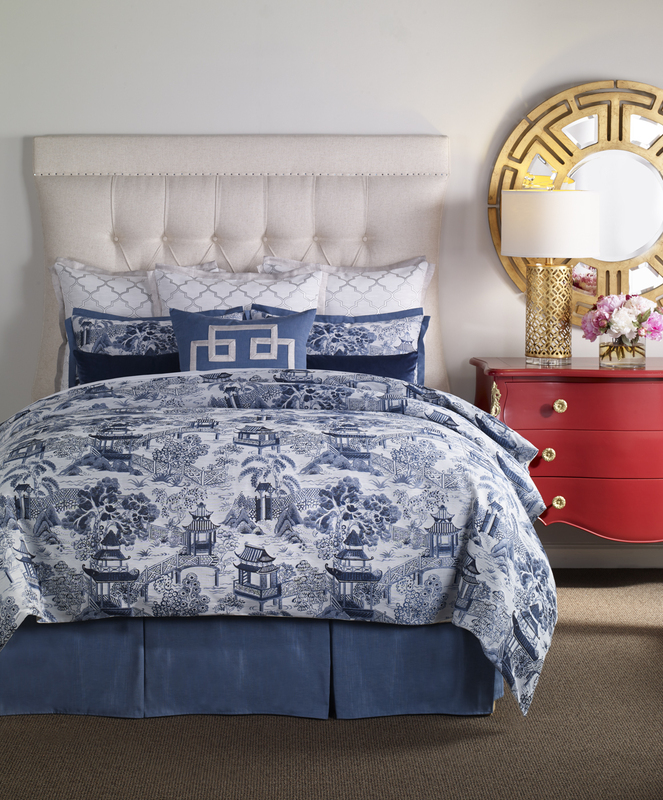 Rumi’s exotic chinoiserie pattern is in gorgeous shades of peacock blue, navy and silver. This collection makes a bold and brilliant statement. 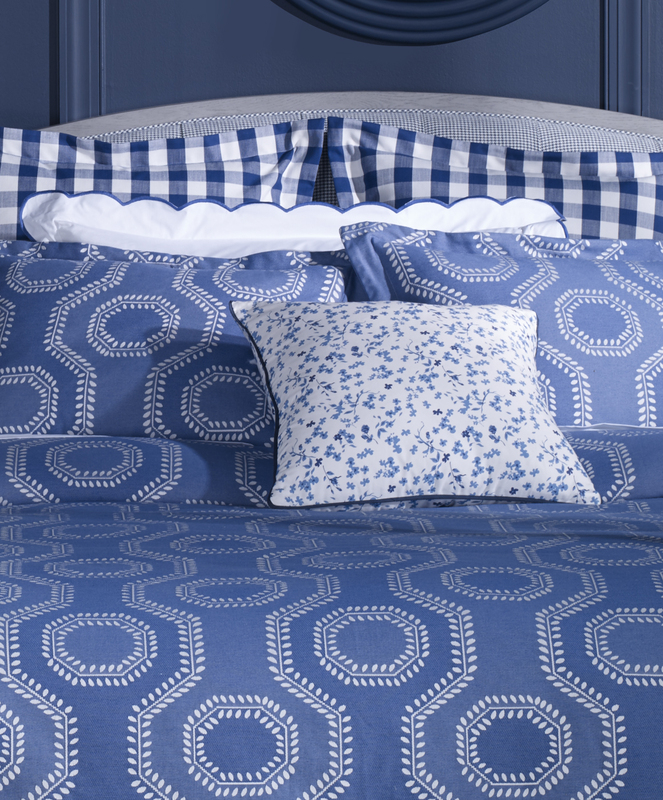 We added our signature 1” split corner flange in Denim London to the coordinating shams and an elegant quatrefoil woven pattern in silver for the euro shams to compliment the pattern and colors of the duvet. The embellished, decorative pillow has a hand-applied, Greek Key detail. We then added decorative, velvet pillows for depth. Click image #2 below to see what's included in the package. The photo shows an Oversize Queen Rumi package with the addition of one euro sham, two decorative pillows, and one queen bedskirt. Full/Queen Duvet 88" x 88"
Oversize Queen Duvet 90" x 95"
King Duvet 90" x 106"
Oversized/California King Duvet 96" x 110"
Euro Sham Sham 26" x 26"
Standard Sham 20" x 27"
King Sham 20" x 37"
We offer some of our best selling collections in our Quick Ship Program. These items will ship in approximately 2-5 business days. Please note that Quick Ship items ordered with non Quick Ship products will take longer and will affect the delivery of Quick Ship items. Many of our Collection Bedding items are in stock and will ship in approximately 2-5 business days. If products are not in stock, these items are made to order and will ship in approximately 2-6 weeks. All merchandise will be shipped UPS Ground Service FOB North Carolina. For a limited time, all merchandise purchased on this website is shipped free of charge. Wildcat is happy to accept returns on stocked items within 10 days of receipt when items are in their original condition. Please contact Customer Service for a return authorization number. No refund will be processed without a return authorization. We will charge a 20% restocking fee for all returns. We don’t accept products that have been used or damaged. Items marked with an come with a full collection. You'll receive a 5x7 inch swatch card with all the fabrics we have used in the collection for easy reference. Let’s keep in touch, follow us!